The carbonate factory produces sediment through the settling of skeletal grains settling or being produced on the sea floor. 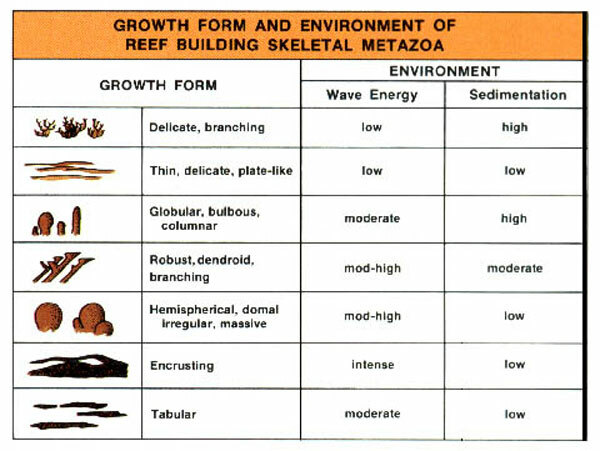 Each biological niche is establised in a specific setting and creates a certain type of sediment. 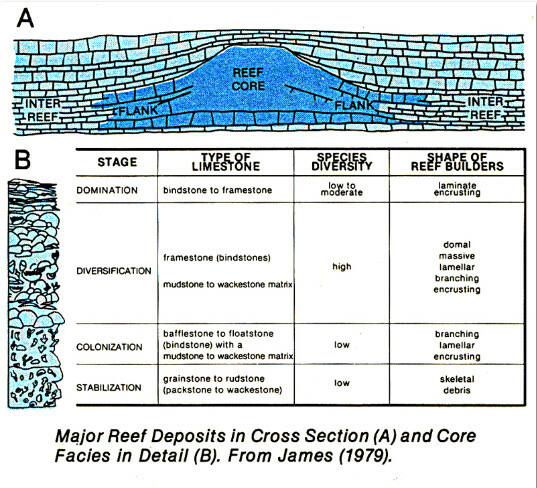 Despite the quantity of sediment produced by the factory the character of the sediment reponds to a number of factors that can change not what is produced in situ and how much sediment actually stays there. Waves: over protected factories waves have little effect upon sediment removal however when the factory is exposed to the full onslaught of wave energy the delicate parts of the factory are easily ripped off and sediment can be carried downslope or upslope away from the shelf margin. Tides: act with a daily cycle transporting sediment and nutrients to the factory and transport the factory towards the shore and/or removing them from the factory and carrying them into deeper water. Tides also change the depth of the water column above the carbonate factory and thus allowing light extend deeper into the water. Storms: represent high energy events that typically act to modify the carbonate factory production. Storms can increase the amount of terrigenous sediment brought into the carbonate seeting as well as extensively damage the orgaisms growing in the carbonate factory itself. An example of this are the hurricanes that hit the Carribean coral reefs each year. Larger expenditure of the energy of a storm typically is cyclic may extend over longer time scales. Oceanic Currents: often brings more nutrients and oxygenated waters to carbonate factories and encourage carbonate growth but they also can bring more terrigenous sediments to the area or even transport carbonate sediments away from the platform.